Marinella Nesso, BA, CYT, M.OMSc. 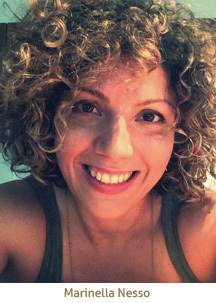 Marinella is a senior & longstanding teacher at YogaSpace. A graduate of the studio’s Teacher Training Program, Marinella has since pursued over 1000 hours of specialized training in areas including therapeutics, prenatal, restorative, and various other advanced yoga practices. She has also completed a Master of Practice in Osteopathic Manipulative Sciences (M. OMSc) at the Canadian Academy of Osteopathy in Hamilton. She merges these disciplines with rigour and skillful intuition: her specialty is the human body. Marinella’s passion for yoga and healing is evident in each class and treatment she offers. Her manual therapy sessions at Yoga Space help heal, strengthen and optimize health and wellbeing. Her understanding and ability to assist body mechanics in relationship with movement, emotions, and experience is unequaled. Most importantly, she kindly guides all students and patients to a practice that is self honouring and full of potential for transformation and discovery. “A practice that begins with the four corners of one’s mat yet is destined to expand to all corners of one’s life”…..has been her guiding mantra over the past eight years of practice and teaching. “I have had the pleasure of being treated by Marinella Nesso with Osteotherapy. Although, it early in my treatment, I have already been overwhelmed by her breadth of knowledge and her kind and generous spirit. I look forward to continuing treatment with her. “ – Lauren P.